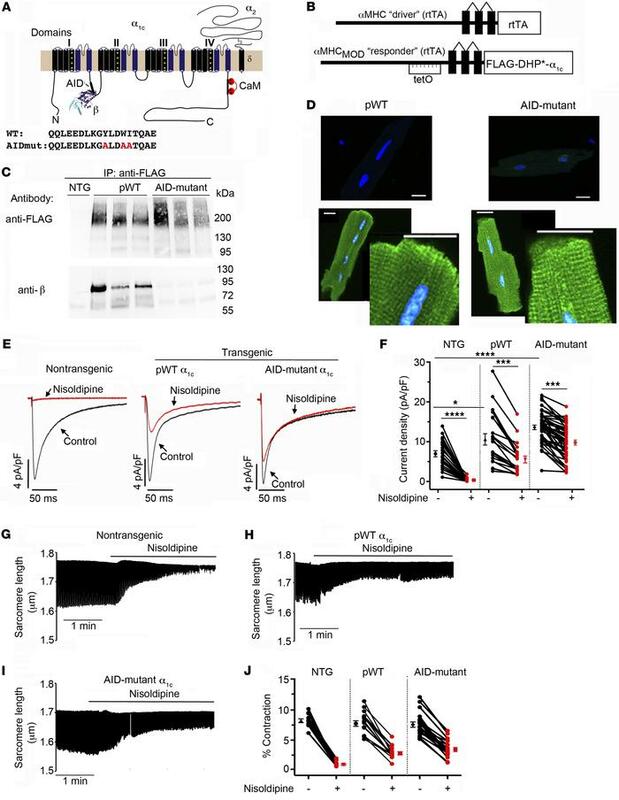 AID-mutant α1C channels trafficking and function in cardiomyocytes. (A) Schematic of rabbit cardiac α1C subunit topology showing β-subunit binding to α-interacting domain (AID) motif in I-II loop. WT and mutant-AID motif in the I-II loop of α1C. (B) Schematic representation of the binary transgene system. The αMHCMOD construct is a modified αMHC promoter containing the tet-operon for regulated expression of FLAG-tagged DHP-resistant (DHP*) α1C. (C) Anti-FLAG (upper) and anti-β immunoblots (lower) of anti–FLAG antibody immunoprecipitation of cardiac homogenates of nontransgenic (NTG), pWT α1C, and AID-mutant α1C mice. Representative of 3 experiments. (D) Immunostaining of pWT and AID-mutant α1C cardiomyocytes. Anti-FLAG and FITC-conjugated secondary antibodies, and nuclear labeling with Hoechst stain. Negative control omitted anti–FLAG antibody. Images obtained with confocal microscopy at ×40. Scale bars: 20 μm. (E) Exemplar whole-cell CaV1.2 currents recorded from freshly dissociated cardiomyocytes of NTG, pWT, and AID-mutant α1C transgenic mice. Pulses from –60 mV to 0 mV before (black traces) and 3 minutes after (red traces) administration of 300 nM nisoldipine. (F) Scatter plot showing current densities before and after administration of 300 nM nisoldipine. Mean ± SEM. *P < 0.05 NTG versus transgenic pWT α1C, ****P < 0.0001 NTG versus transgenic AID-mutant α1C and also NTG pre- versus post-nisoldipine, ***P < 0.001 pWT or AID-mutant α1C pre- versus post-nisoldipine. One-way ANOVA and Dunnett’s multiple comparison test. NTG, n = 8 cardiomyocytes from 5 mice; pWT, n = 21 cardiomyocytes from 7 mice; AID-mutant, n = 45 cardiomyocytes from 9 mice. (G–I) Representative time courses of changes in sarcomere length after superfusion of 300 nM nisoldipine-containing solution for cardiomyocytes isolated from NTG mice (G) and pWT (H) and AID-mutant transgenic α1C mice. Cardiomyocytes were field-stimulated at 1 Hz. (J) Scatter plot showing percentage of contraction of sarcomere length in the absence and presence of nisoldipine for cardiomyocytes isolated from NTG mice and pWT and AID-mutant α1C transgenic mice. NTG, n = 12 cells from 3 mice; pWT, n = 16 cells from 3 mice; AID-mutant, n = 18 cells from 3 mice.